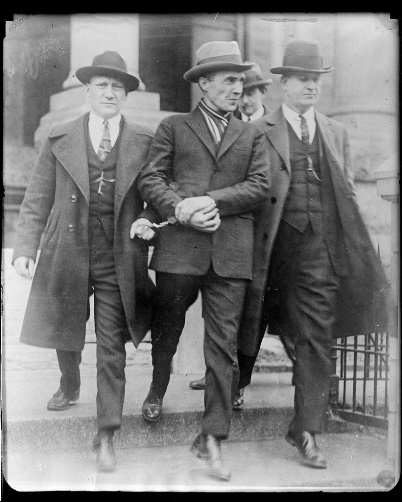 On October 12, 1924, in New Britain, Connecticut, Gerald Chapman became America’s first “Public Enemy Number One.” Having set out that morning from nearby Windsor, Chapman and his accomplice, George Anderson, broke into the Davidson & Leventhal department store on Main Street in New Britain. A nearby hostler witnessed the two men enter the building and called the store’s owner. Moments later, the New Britain police arrived. In all, 5 officers responded to the call. Arriving at the scene, they split up to cover the department store’s various exits. Officers Atwater and Skelly moved along the alley behind the store and entered through door used by Chapman and Anderson. Unfortunately, the officers walked in just as Chapman came down the rear stairway. Atwater ducked behind a store counter while he moved to ready his weapon. This left officer James Skelly standing in the doorway—the lone obstacle blocking Chapman’s escape. Chapman raised his pistol and fired, hitting Skelly in the abdomen. Skelly fell and Chapman ran down the alleyway toward the front of the building. He stopped briefly upon reaching the sidewalk and notified a stunned bystander about the shooting, then proceeded to stuff his pistol in his coat and disappear down an alley a few doors away from the crime scene. Officer James Skelly identified Chapman as the assailant before authorities brought him to New Britain General Hospital. He died there 3 hours later. In the wake of Skelly’s death, local law enforcement labeled Chapman “Public Enemy Number One”—a title seized upon and publicized by media outlets across the country. The New Britain robbery was not Chapman’s first brush with the law. In 1921, Chapman and Anderson (and a third man, Charlie Loeber) robbed a New York mail truck and made off with over $1,000,000. Captured and convicted, Chapman and Anderson each received 25-year sentences but escaped from a federal prison in Atlanta, Georgia, in April of 1923. On January 18, 1925, 4 months after the death of James Skelly, police captured Chapman in Muncie, Indiana. 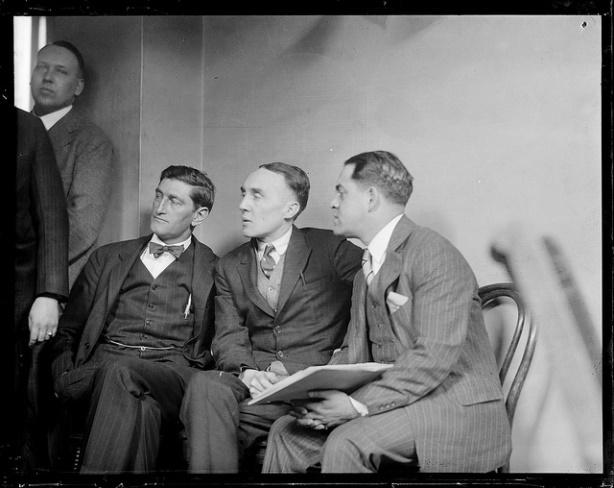 Upon hearing of the arrest, New Britain Police Chief W.C. Hart and State’s Attorney Hugh Alcorn requested authorities send Chapman to Connecticut to stand trial for murder. The subsequent trial resulted in a conviction that carried with it the sentence of death. While Chapman waited for authorities to carry out his sentence, police caught George Anderson passing counterfeit money in Muskegon, Michigan. An exchange of gunfire on October 31, 1925, resulted in the deaths of Anderson and Michigan detective Charles Hammond. The State of Connecticut executed the other half of the deadly Chapman-Anderson partnership just 5 months later. “Officer James Skelly.” New Britain Police Department, 2014. Link. “The First ‘Public Enemy Number One.’” National Postal Museum, 2014. Link. Baer, Charles A. “Executions in Connecticut since 1894.” State Capitol, 1972. Connecticut State Library. Link. Jeffers, H. Paul. Gentleman Gerald: The Crimes and Times of Gerald Chapman, America’s First “Public Enemy No. 1.” New York, NY: St. Martin’s Press, 1995. Cane, Ryan. “Nationally Renowned Bandit Met Hangman After Killing New Britain Officer.” Hartford Courant (1887-1922). April 10, 2014, sec. Hartford Courant 250th Anniversary. Link.